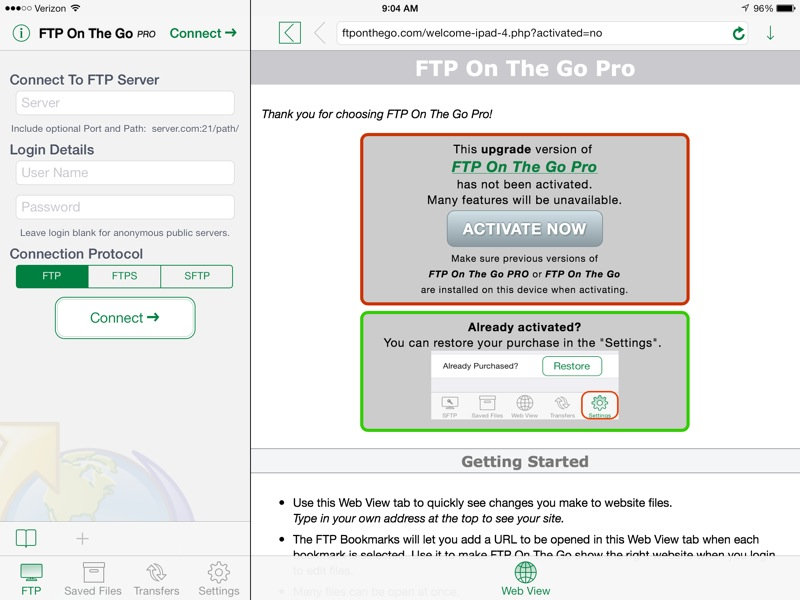 I've been a long time user of FTP On the Go Pro for iOS. It's not the prettiest FTP client but it works well and has some of the nerdy features I want.1 Recently, I opened the app and was greeted with an alert message proclaiming that there was a new version of the app available and that I could purchase it with upgrade pricing. Well, that seemed a bit odd. We all know that there is no such thing as upgrade pricing in the App Store. I've heard repeatedly that this lapse is what will kill off all quality application development for iOS. It's just not possible to do upgrade pricing. But, I was curious about their offer. Huh. Well, this seems different. But so far, I'm not out any money, and it's an approved app. So I click the "Activate Now" button. Ok. So that seems normal, but it is a discounted price, as promised. 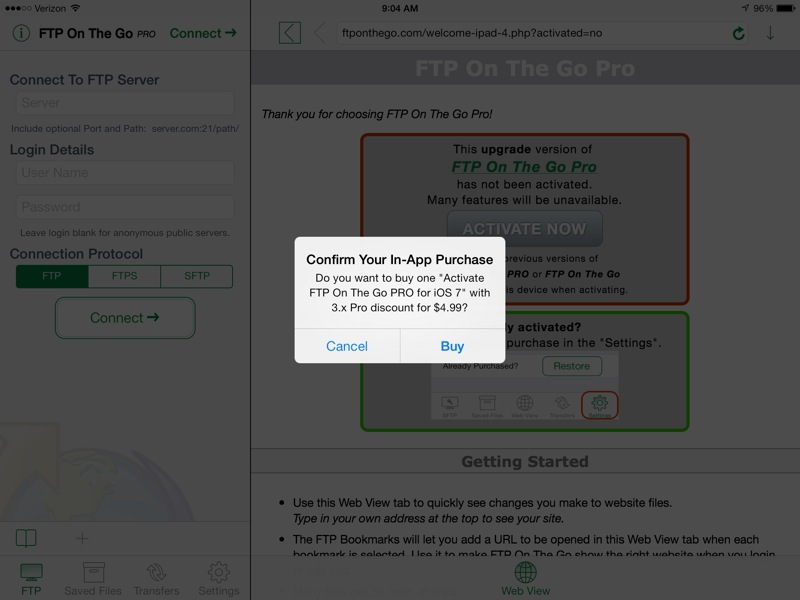 FTP on the Go for iOS 7 is $10. This upgrade is $5. That seems pretty good, so I went with it. I use the app several times a week. If I get notified of a typo on this blog, I usually fix it from my iPhone or iPad with their app. I'm happy to kick them a few extra bucks. But, what the hell is going on here? There are three different versions of the app on the App Store. The original ($7), pre-iOS7, app, the new iOS7-only version ($10), and an upgrade version ($5). I'm sure it causes some confusion for potential customers searching the App Store for an FTP app. I bet it's no more confusing than just searching the App Store though. In the end, I probably would have paid the full price for the new version even though it's really only a re-skin of the old version. But I still applaud their cleverness. They've given their customers a way to feel good about an upgrade2 and apparently found a way to do it without relying on typical IAP unlocks to power their business. We went with a very simple way, because it works with even very old versions of the earlier apps. Apps can say they handle a "URL Scheme" so instead of http:// opening the web browser, fb:// will open the facebook app. Other apps can check if a particular scheme is supported. Our ftp apps just have their own scheme that can be checked. Depending which if any the earlier FTP apps it finds, it shows the different in-app purchases as you saw :) As far as we know, we're the first to do anything like this to offer discounted upgrades to previous owners. Like I said, it's clever and I like it.